Peter Sauber has transferred a third of the equity in his team to chief executive officer Monisha Kaltenborn. 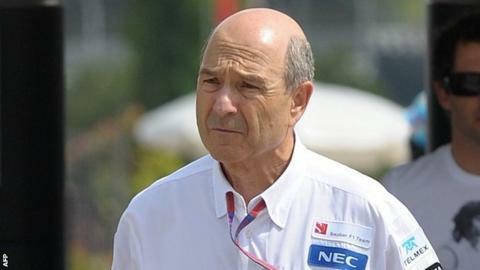 Team principal Sauber, who has retained the remainder of the shares, said the decision "represents an important step for me in providing continuity". The 68-year-old added: "My desire is to ensure the company continues to be led as I would want over the long term." A spokesman said the shares were "a gift" and no financial transaction was involved. Monisha Kaltenborn has been at the team in various roles since 1999 and was promoted to CEO in 2010. She is the first woman to be in charge of an F1 team. Sauber said Kaltenborn had been "instrumental in the team's survival" following the decision of former partner BMW to pull out of F1 at the end of 2009 and that "since then she has been doing outstanding work as CEO". He added: "Monisha Kaltenborn and my son Alex, who joined the company as marketing director in 2010 and has since also been a member of the board of management, both embrace this aim. It means we can offer our employees a positive outlook for the future." Kaltenborn said: "For me this step is a mark of the greatest possible trust, which I will do everything in my power to justify." Sauber entered F1 in 1993, initially as the works team for Mercedes engines, but continued as a privateer until they were bought by BMW in 2006. The team have generally been midfield runners but this year has seen a marked upturn in form, with the cars regularly qualifying in the top 10 and contending for points. Sergio Perez scored their best result since Canada 2008 when he finished second to Fernando Alonso's Ferrari in Malaysia, the second race of this season.